James L Brooks' How Do You Know, one of the rare recent examples of a big budget spent mainly on actors, is doing very poorly at the box office, as is The Tourist, starring Angelina Jolie and Johnny Depp. This is probably because they're bad films, but it makes me wonder what happened to the star-driven drama. I can think of few hit films of the recent past that compare with Brooks' previous Jack Nicholson starrers, As Good as it Gets and Terms of Endearment. Thirty years ago, the second highest grossing film of 1981, behind the leader Raiders of the Lost Ark, was On Golden Pond, starring Katharine Hepburn, Henry Fonda and Jane Fonda. 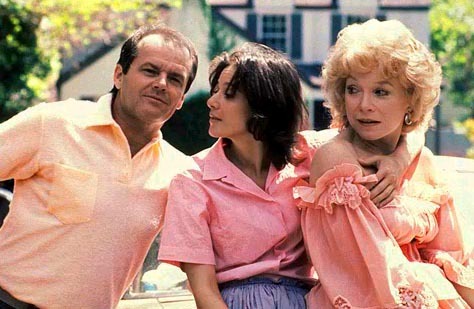 In 1983, the aforementioned Terms of Endearment, in which Jack Nicholson teamed with Shirley McLaine, was second behind Return of the Jedi. Dramas had been overtaken by comedies and special-effects laden blockbusters, but movies with big star casts that not only became hits but were contenders at the Oscars, retained a secure niche. I guess there were three films in 2009 that might make that category: The Blind Side, Up In The Air and Julie and Julia, though I'm not sure if the latter two qualify since they ranked no. 38 and 34 respectively in the annual box-office standings. There hasn't been a single release of the kind I'm talking about so far this year. Nor was there in 2008, when Angelina Jolie's The Changeling was 80th, and Sean Penn's Milk 89th; or in 2007, when Johnny Depp's Sweeney Todd ended 49th, George Clooney's Michael Clayton 55th and Daniel Day Lewis's There Will be Blood 66th on the annual charts. The last Oscar winning, box-office topping, star-led drama I can think of was A Beautiful Mind. The Academy awards are shifting to niche movies as a result of the drying out of powerful mainstream dramas. Not a happy trend for their ratings. But I wonder why Hollywood's no longer making movies of the On Golden Pond, Out of Africa, Rain Man and Dances with Wolves variety. Any thoughts? Who needs stars when we can have animation! Animation's where the stars get their big hits these days. It's funny, but I'd never really thought about this in quite these terms before. I always think of George Clooney and Angelina Jolie and their ilk as winners, but maybe I'm not seeing this in terms of the bigger financial picture. Seana, an interesting division has opened up in their careers, where they do big budget action flicks (Salt, Mr and Mrs Smith, The Ocean's trilogy) to keep their box office power alive, and then smaller, edgy films like Syriana, Michael Clayton and A Mighty Heart that get them award nominations. That wasn't the case earlier. Marlon Brando won Oscars for On the Waterfront and The Godfather which were big box office successes. On Golden Pond, I think is a great example of what's changed. Almost unthinkable that it was the number 2 film at the box-office the year it was released, and of course the cast was nominated for Oscars with Henry Fond, I think, winning. That sort of success for relationship-based dramas seems to have faded entirely, which is a pity. I was looking up some statistics to see if they confirmed something I've heard, which was that the movie industry is geared toward pre-adolescent boys. Didn't manage to validate that, but did find this site, which showed some 2009 statistics. The one that startled me was that women comprise 55% of all ticket sales. I actually wonder how they get that info, since couples so frequently purchase tickets together, fairly often still by the guy. Anyway, as they said on that site, strange then that character driven movies are on the decline. Although I suppose a lot of women buy tickets with kids in tow. See a lot of things like Toy Story that way, I'll bet. Yes, I think mothers are much more likely to accompany kids to movies than are fathers, so that's definitely one reason for the imbalance. Aside from action and effects driven films, the romcom genre has been very strong for a long time, and that also skews very heavily toward women. There was an interesting study by some conservative analyst years ago which showed that films rated PG-13 and under drew most audiences and yet Hollywood created a disproportionate number of R-rated films. The implication was that directors were being allowed to make the kinds of movies THEY would like to see rather than what the average Jane would like to see. I don't know how influential that critique was, but I do sense in recent years a shift away from R rated films, apart from the niche horror genre. But I haven't seen the stats on that, so maybe I'm plain wrong. It looks like Hollywood is slowly turning way from making dramas as there is nothing fresh to offer. Drama is something that enticed people of their own lives, 30 years ago we had problems , mostly human ones. With the arrival of computers , gadgetry , into our lives, things have changed badly. I mean, divorce has become normal, living together has become the norm. Breakups are being handled better and better, so where is the real drama in our real lives? Very True, Srikanth. Revolutionary Road is a great example of the phenomenon I've alluded to: a big-name drama that garners acting awards for its stars, but makes little money. I don't believe there are no dramas to be had in human existence from here on out, but it may take some new vision of them to make them compelling to a huge audience again. It's really amazing that people go out to movies at all anymore, given their other options. But the same could be said about bookstores, and thankfully, ours is still hanging on. People do still need somewhere to get out of the house to, after all. Another contributory factor to the dwindling aura of stars could be that in the age of the internet & social media, star-aura itself is not what it was a couple of decades ago. The constant over exposure to their lifestyles in all forms of media probably ends up diluting the sense of anticipation from a star-powered movie release. I agree, Satish, though it's a bit paradoxical in an age as obsessed with celebrity as ours.